Rockefeller Center buildings are not overembellished with decorations. 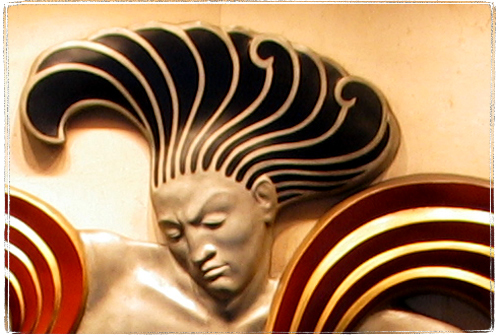 A few major buildings have beautiful art deco relief’s on their facades, but most lesser buildings don’t have those. On the other hand an underground tunnel that connects the buildings has this beautiful mural on the wall. I’ve been passing it by for many years without thinking too much about it. I called it “A Half Naked Punk Whipping Two Naked Women”. 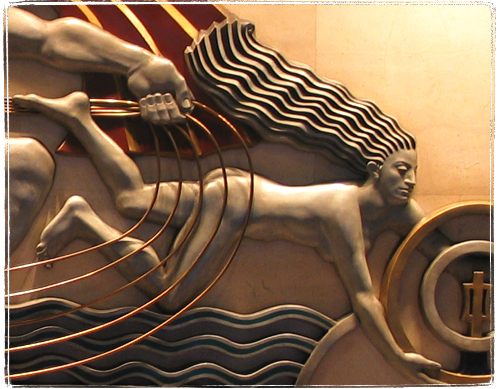 I came by a photograph showing this bas relief on a side of a building. But it’s in the underground tunnel, I thought. 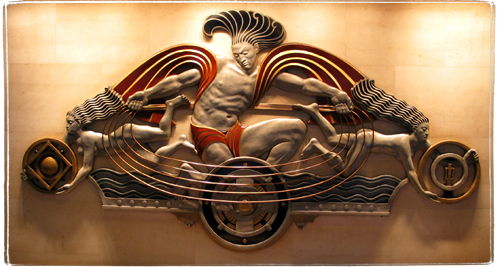 Well, as I learned from the book (and could have learned from the little plaque on the wall), the bas relief is actually called “Radio and Television Encompassing The Earth” and a similar plaque used to be on the 49th street facade of the demolished RKO Roxy Theater aka Center Theater. The piece if based on a watercolor of Hildreth Meiere. I wonder what happened to the original plaque..